A sign of the maturation of a society is the development of its own literature, culture and art. This has been the case for every place Islam reached since its inception. The style and form of ‘our Islam’ varies immensely between China, North Africa, the Middle East etc; all adopting the customs of the local people whilst staying true to the demarcations of the sacred law. Despite the difficulties our community is facing in the west, we are seeing the development of this gradually as we settle within our communities. 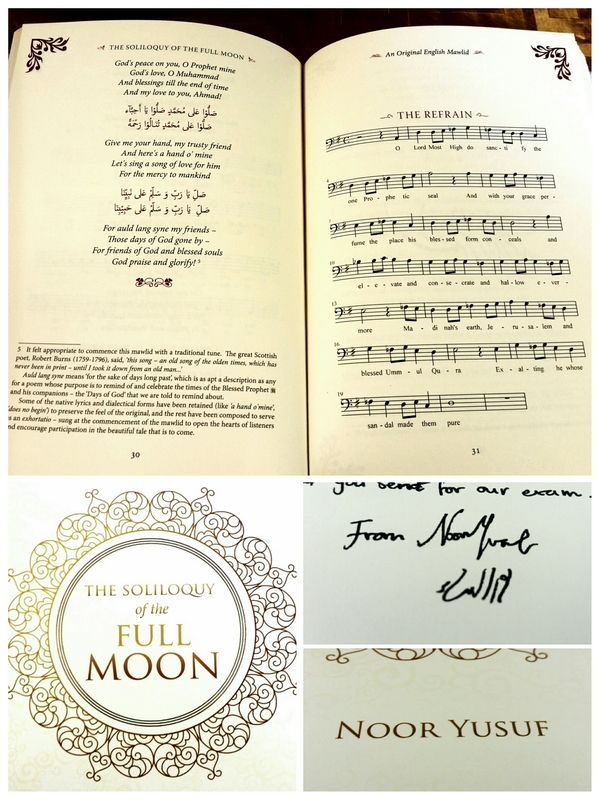 A beautiful example of this is “The Soliloquy of the Full Moon”, a wonderful ‘nativity’ (known as Mawlid in arabic) written in rhyme describing the birth of our beloved Prophet Muhammad (salla allahu alayhi wasallam). What’s wonderful about this is the centrality nativity plays held in our communities in the west, hence offering an English edition of such a story for muslims is incredibly valuable. The Book was written by Noor Yusuf, an upcoming student of knowledge with exceptional talent. The eloquence and detail woven into the words is mesmerising, demonstrating a maturity beyond her age masha’allah (she’s only 16 masha’allah!). May Allah bless her, her father Sh. Asim Yusuf, and all those who contributed towards this book! I have the Arabic version , and I can’t not find the time to go to my shaykh/teacher now days .. I still hope I find time to go him. Anyways much blessings Talha . Arabic version? I believe this book is just in English? I thought that this Book was the translation of the Mawleed . Oh, I thought it was a translation .